BLUESTAR, FIRESTAR, AND GRAYSTRIPE ARE RELATED :D. . Wallpaper and background images in the Warriors (Novel Series) club. I think I get it... 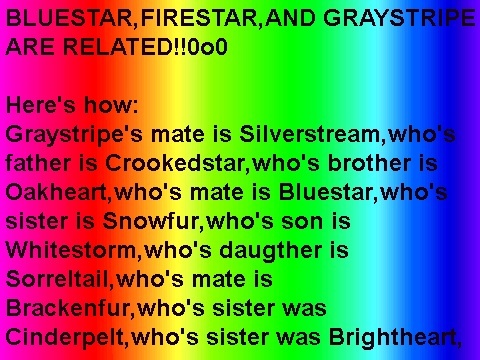 Since Silverstream was Oakheart's neice and Graystripe's mate, while Bluestar was Oakheart's mate, Bluestar and Greystripe are related, not blood related, but legally related, and Brightheart is Bluestar's great neice-in-law (I think) and Cloudtail, Brightheart's mate, is Firestar's nephew! So basically, Bluestar is Greystripe's and Firestar's aunt-in-law? well.......millie is greystripe"s mate now, but I never really thought about it. Its very confusing. Well I know what Scratch is. (:O I have never thought of that....Haha! So take this and shove it in your face Darkstripe >:D!